Description: Daily Handwriting Practice, Contemporary Cursive, is more than just a handwriting book, it is a learning tool that helps developing young minds practice basic skills in an interesting and unique way. For example, on the topic, "What is work," students learn about simple tools and the physics applied in using them. Students write letters, words, and sentences about a variety of content area topics appropriate for the classroom. 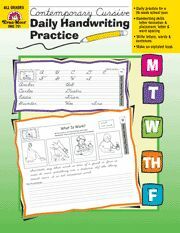 Monday through Thursday, the weekly subjects for writing exercises range from famous inventors to famous quotations, amazing hunters to the water cycle. On Friday, a full-page exercise draws the topic to a close by reviewing what was learned earlier that week. All 112 pages are reproducible. This new book comes from an independent book store in the United States. Shipped quickly and we provide a USPS tracking number. Expedited and International Shipping available.